At the first point of the data collection process, the WeighStation program, operating under Windows 95, 98, NT, 2000, ME, XP, or SQL, provides the means of capturing real time data at the point of sale. At the first point of the data collection process, the WeighStation program, operating under Windows 95, 98, NT, 2000, ME, XP, or SQL, provides the means of capturing real time data at the point of sale. The WeighStation program is designed and written for the Windows environment. The program can be run using the keyboard, a mouse, or a combination of the two. 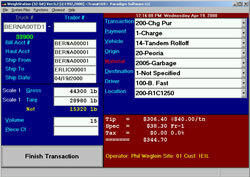 The WeighStation program has a single screen design so the user is not confused by information overload. The user is presented with all the information necessary to complete a transaction. Through the menu bar or function keys, the user can query the truck or account fields from a screen similar to the one below. The user can also pull trucks out of the hold file. The user can also get on-line help and more. All of these options are available when the user needs them, all within the same program. WeighStation also has the ability to assess multiple material or origin types to a single transaction. This capacity eases the processing of trucks that carry several different types of materials in one load or pickup from different haulers on one trip. WeighStation can add fees for hard-to-handle items or special disposal items. This fee is in addition to the regular charges. If a load is entered into WeighStation incorrectly, no problem, the program allows the user to void a transaction. WeighStationä can be customized to prompt for a reason for a void. Unattended mode allows a scale to be operated without an attendant. This is useful for trucks that come to your site often or for an express lane. At any time during the course of the day, at the press of a button, you can view current operation totals for one or more sites at a time. WeighStation gives you the ability to track each operator's monetary activity during the course of a day, making sure your totals match those of the system. There are also stored reports that can be printed from within WeighStationä for immediate information on the current day's business. The WeighStation program was designed with the concept that each transaction has certain properties that define how that transaction is to be processed. Properties such as the flow of trucks around your facility, which printers and scales to use and when, what information to collect and how to bill, are some of the operational choices that are given to the user. This capability permits the site operator to tailor the system to fit the facility's needs. Easy to customize, easy to learn, easy to use…WeighStation.